Many gamblers already feel that slots can be expensive. They therefore want no part of high limit slot machines. However, the high stakes slots experience can be rewarding for those who can afford it. Keep reading to find out what you can expect when playing these pricey games in brick-and-mortar casinos. High limit slot machines are typically located in posh areas. The ugly casino carpet is still there, but the furnishings are nicer than what’s seen on the main floor. What’s more exciting is that high stakes players get the best comps. Cocktail waitresses come around more often, and gamblers are given more freebies by the casino. High stakes slots rooms may not quite rival the VIP baccarat area. But they’re fun places to enjoy slots in style. They don’t call them high limit slots for nothing. These games require a large minimum bet in comparison to regular slot machines. The minimum wager depends upon the casino. But you’re normally looking at games that require between $25 and $100 for a single spin. The max limits also vary based on the establishment. I’ve heard of slots going up to $5,000 limits, while many of these games at least allow $500 bets. 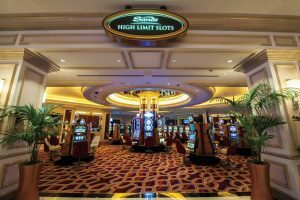 Should You Play High Limit Slot Machines? Slots are volatile games that don’t see you win prizes frequently. This volatility only stings worse when you’re betting between $25 and $100 per spin. Whether or not you play these games is a matter of personal preference. However, I wouldn’t suggest doing so unless you’re a millionaire. Even betting $25 per spin puts your bankroll to the test during a rough session. Wagering $100 or more can really leave you facing big losses. Evaluate your own situation to figure out if high limit slot machines are right for you.